During the long civil war in Cambodia occurring more than three decades ago, the country management systems were completely damaged. The Khmer Rouge Genocide Regime, when the dictator Pol Pot ruled was a brutal period. From 1975 -1979 there were almost two million people killed, 25% of the total population. This has caused dire poverty in Cambodia until today. The Cambodian government works hard to improve the country but there is still much more needed especially in the realms of health and education. Families in the rural areas earn less than $2 per day and can not afford to build wells or send their children to school. 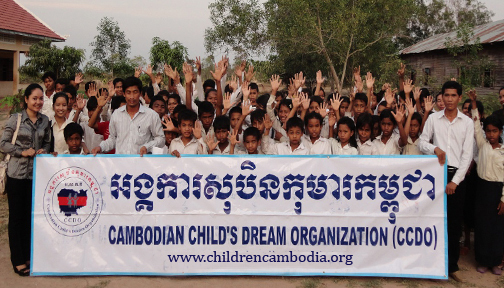 Each child needs to provide their own school supplies and uniforms. The teachers work double session for a meager pay. The management teams of “Amazing Angkor Travel & Tours” in Cambodia set up អង្គការសុបិនកុមារកម្ពុជា “Cambodian Child’s Dream Organization”, a non-profit and non-political charitable organization, officially licensed by the Ministry of Interior of Cambodia on 10th Oct 2008 (License No.1269). The project aims at building, clean water wells, schools, libraries, language training skill and providing scholarships to school children not able to afford the luxury of paying for books and uniforms.